So you’re ready to pop the question – congratulations! But before you can propose, you’ll need to pick out the perfect engagement ring. It is important to consider your girlfriend’s style and taste when heading to the jeweller. Hopefully your girlfriend has given you some hints into the type of ring she wants, but if not, don’t fret. Here’s a helpful guide to the most popular styles of engagement rings. Tip: Don’t be afraid to ask your partner’s best friend for advice! A round cut is often referred to as a round brilliant solitaire, and is traditionally the most classic style of ring. The shape of the ring resembles a cone, which helps to provide maximum light return (and make the diamond sparkle). 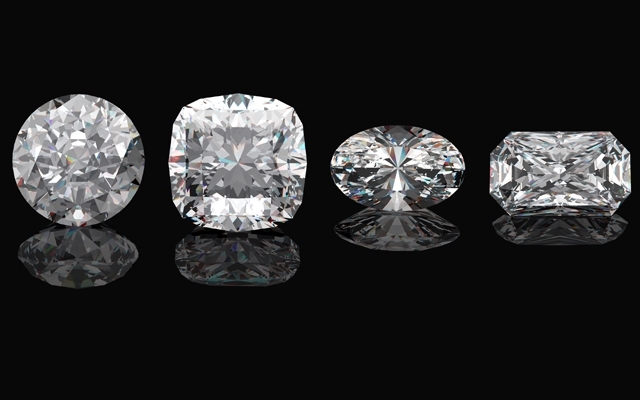 Round cut diamonds have the most brilliance of any diamond shape. A princess cut is one of the most popular styles of engagement rings. The diamond is cut in a square shape, with four beveled sides (that look like an inverted pyramid). An oval cut diamond possesses an oblong shape, and is favoured as an alternative to the classic round cut. Since the oval diamond is cut the same was as a round diamond, it shares the same brilliant sparkle quality. The emerald cut is rectangle shape with cut corners and steps that lead to smaller rectangular planes. The style of diamond is an affordable option for those working with a budget (a 1 carat emerald is less expensive than a 1 carat round). Once you have chosen the style of diamond, you can start to consider other factors such as whether you want a diamond band or other embellishments. While some brides prefer a simple band, others prefer a band with more sparkle. A popular band setting is the Pavé. A Pavé setting (which means paved) is when the surface of a band is covered in diamonds. Another beautiful addition to a ring is a diamond halo. A diamond halo is a strand of diamonds that surrounds the centre diamond. There are many elements to consider when choosing the perfect ring. Once you have an idea of what you’re looking for, make an appointment with a reputable jeweller who can show you ring samples and help you make your final decision.